THIS Sunday, 7th October, we celebrate our Harvest Festival. This will be mainly focused on the 9.30 Family Eucharist, but the other services also take up the theme. 9.30 FAMILY HARVEST EUCHARIST members of our Children's Groups will help lead the service with readings, prayers and a special Harvest Presentation. Children offer food - tinned tomatoes, sweeetcorn, kidney beans, chickpeas, soup etc etc, & dried herbs, powdered custard, breakfast cereals, rice, pasta, etc etc - to provide throughout the winter nourishing meals served by the UPPER ROOM to local homeless & destitute people. 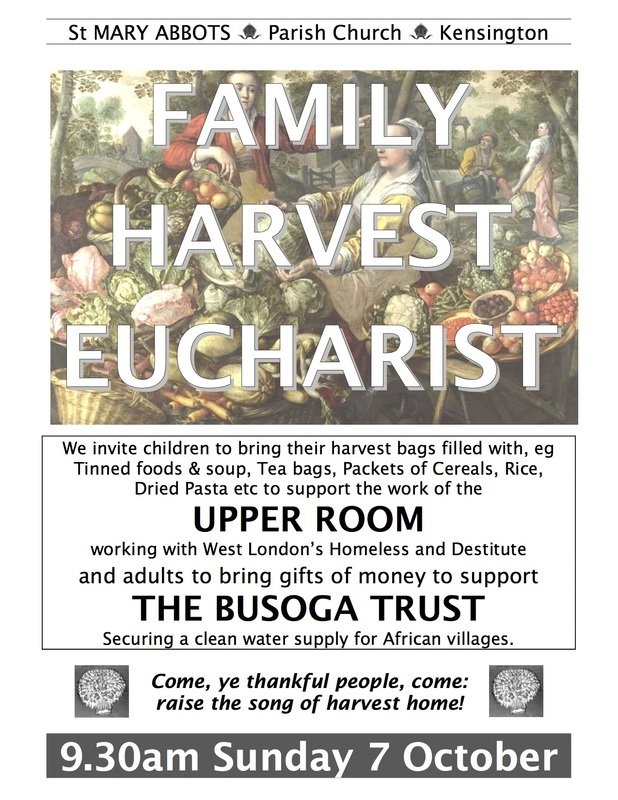 Adults offer money - and collections at all next Sunday's services (other than pledged Stewardship) will be in aid of the BUSOGA TRUST to dig more St Mary Abbots wells in Uganda (see display on notice board).